Contest Update: The winner of this week’s photo contest is Vincent Giordano, who garnered 8 out of the 10 votes cast! Congrats Vincent! Only ten votes. More than 100 people checked out the page, but only 10 voted. It’s time to start pandering to my base, and increase voter turnout. I received four entries for this week’s food photo contest – thanks so much to everyone who sent in a photo! Here’s how the contest will work: I’ll post all the photos below, and then the poll at the bottom. Readers can vote for their favorite photo; the poll will end on Monday at 5pm. This week’s prize? Bragging rights. Maybe next week there will be an actual tangible prize. Anyone got anything they’d like to donate to this contest? Photo by Vincent Giordano. 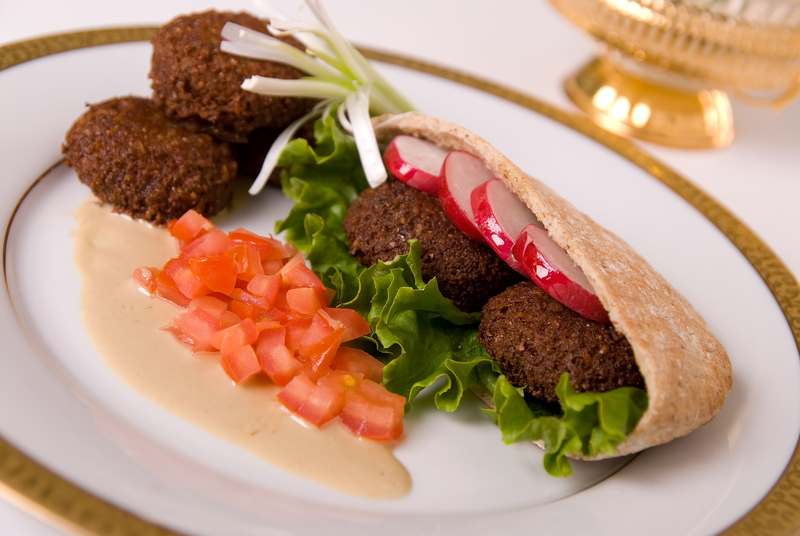 Says Vincent: This is my favorite dish that I photographed: falafel in pita bread dressed on a gold lined plate with tomatoes and lettuce with a garnish. I went on a shoot for a woman who was putting together a Middle Eastern cook book. The best part of the shoot, I was able to eat it afterward...........Perfect! Photo by Patricia Barney. 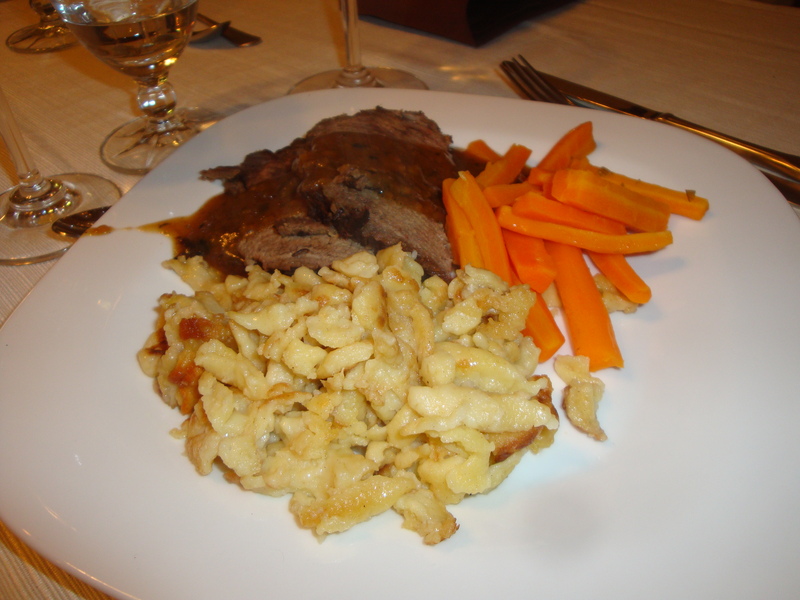 This is a photo of Sauerbraten, with spaetzle and carrots. This dish was actually made by yours truly, for a Kiwanis fundraiser I held at my house. Yes, this is the famous Sauerbraten about which much has been written. Please do not let this fact influence your vote. Photo by Nell Burrows. Note from Nell: This is a centerpiece I constructed from green fruit. 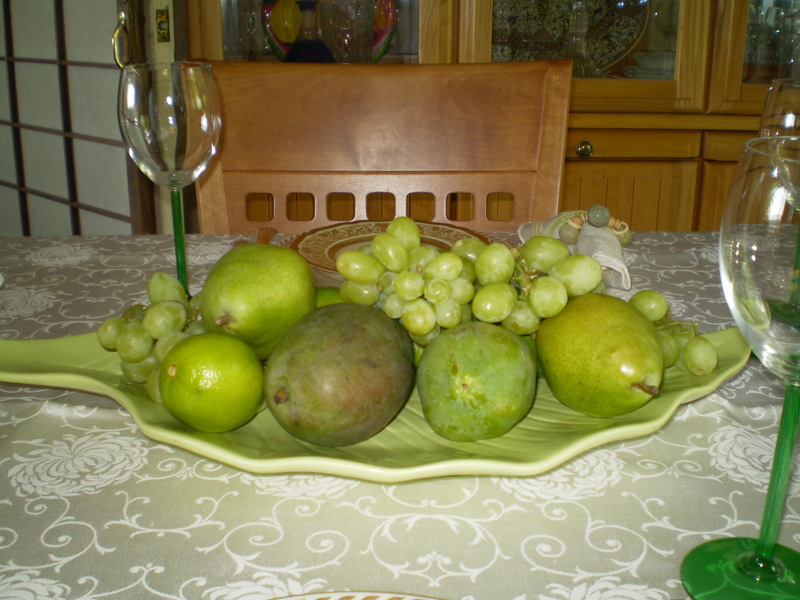 Apple, pear, mango, papaya, limes, and grapes on a green leaf shaped platter. I’ve also done it with red fruits – blood oranges, pomegranates, red grapes, plums and red bananas. Quite dramatic and yet – so easy. Photo by Alisa Costa. 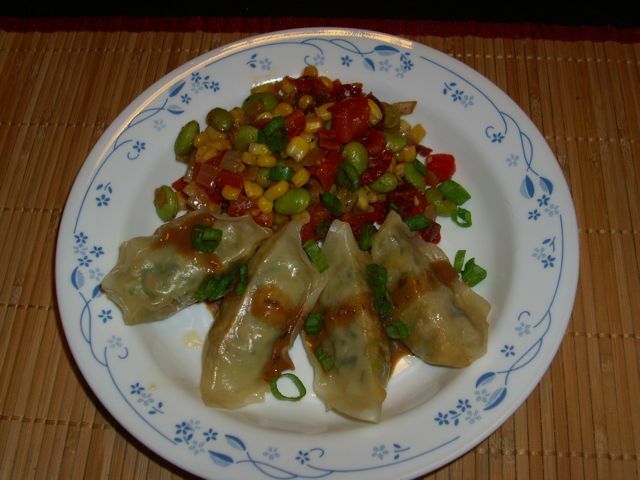 Alisa did not tell me the name of the recipe (the photo was simply titled "Yumm"), but I am guessing that it is vegetable potstickers (or gyoza) with an Asian succotash on the side. Am I even close?